Thanks to our friends at SYN Media we now have a great new video documenting the Regional Arts Victoria Creative Leadership Program from February 2015. Meet this year's creative leaders and our Education & Families Manager, and find out what went on in this year's exciting program. 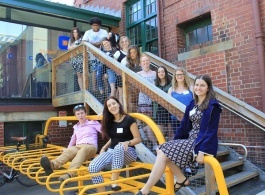 Regional Arts Victoria’s Creative Leadership Program takes 12 young emerging arts leaders from regional and remote Victoria and immerses them in a nine-day intensive of workshops, talks and placements. Scroll through the Twitter hashtag #RAVCreativeLeaders to revisit the 2015 program. Check out our new video from this year's fantastic Creative Leadership Program!